We have categorized the projects by season to help you in planning when to work on each project; however, some of the projects can be done in different seasons, so be sure to explore the entire site! Click on any Season to begin exploring ways that you and your group can help restore your watershed. W.A.T.E.R. is intended to be an ever-growing toolkit of resources and activities, so if you have a suggestion for an additional activity or a missing resource, please feel free to contact us and make your suggestion. You can also use our templates to create a sponsor letter to fund-raise, a press release to get the word out, and a liability waiver for participants. Fall is the time of harvest and the time to go back to school. The weather is cooler so it is a great time to plant in anticipation of the upcoming spring. We suggest projects for the fall that take advantage of the end of the growing season, the moderate temperatures and harvest-time. Collecting native seeds is a great way to help provide tree stock to be planted along streams as buffers and to help regenerate our region’s forests. The majority of eastern hardwood trees drop their seeds in the late summer into the fall, making the fall the ideal time for this event. The seeds collected from native seed collection events are donated to state nurseries, where they are grown into seedlings. In the spring, volunteers can then plant seedlings grown from seeds collected two to three years prior along rivers and streams throughout the watershed. Storm drain stenciling is a warm weather project and one ideally done during dry periods, such as the fall. Stencils, which carry slogans such as “No Dumping. Drains to Stream,” need time to dry and set. For this reason, we placed this activity in the fall section of the toolkit, but it could just as well be done in the spring or summer. Containerized trees need some time to grow before being planted. Once they are planted they need to have some time to reestablish their roots before going dormant. For these reasons, plantings such as these work well in the fall. 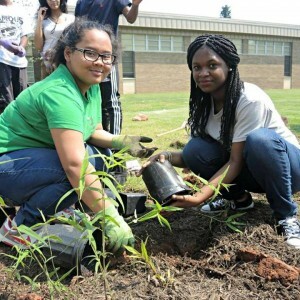 They can also be done in the spring, but are not recommend for the summer because newly-planted trees can be stressed by hot temperatures and dry conditions. Winter is the time to stay warm and toasty indoors while preparing for the upcoming spring. Larger projects that can be completed in garages or sheds are great for this time of year. Other indoor projects such as creating a watershed fact sheet or a letter writing campaign are great to do when it is chilly outside! 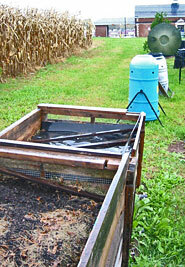 Worm bins are composters for your food waste and what better time to build something to make soil for the spring than the winter when you can’t get outdoors the way you’d like? Although they can be built anytime, the winter is a good time because some worm bins are designed to be used indoors – keeping you from going outside to put materials in your compost heap! Nest boxes are best built in the winter while the birds that will use them are away. This is a great activity to build anticipation for the spring. Volunteers will enjoy constructing their bird house and learning how to be a great landlord for their future tenants. This is another activity to make you look forward to the growing season. Building a bin to compost your yard and food waste is an optimistic activity and one best done when spirits can be low because of the dark and cold winter. Although this activity is great to keep away cabin fever, it can be done in any season. Winter is the time for reflection—a quiet time when the chores of the rest of the year have been left behind. Having put down your outdoor restoration tools, it is a good time to pick up another tool: the pen. Writing a watershed fact sheet is a great way to advertise your organization and to inform people why your watershed is worth protecting. Another way to fight to protect your watershed is by getting in on the agenda of your elected officials. Winter is the ideal time to mount a letter writing campaign because it can be done indoors and because your elected officials are likely at work – not out campaigning or vacationing! Although winter is a good time to write, it is appropriate anytime an important issue arises. Most northern deciduous tree seeds need to over winter outside in order to germinate in the spring. Planning a native tree-planting event from seed is an ideal spring follow-up to the native seed collection event that you organized last fall. By planting seeds in the spring, your volunteers get to see their earlier efforts come literally to fruition! When you think of spring, one of the first things that comes to mind is spring-cleaning. Spring-cleaning extends beyond the house to your local watershed. Spring is a good time for this event because litter that has built up over the winter needs to be removed before spring flooding washes it further downstream. This event is good to do before the leaves come out, but it can also be done in the fall after the leaves are on the ground. What better way to celebrate the spring rains than by building a rain barrel to capture this bountiful resource and put it to good use? Capturing rain water reduces runoff, but it also gives you water to use on your lawn or to wash your car all while reducing your water bill. This activity can be done year round. Bats come out of their winter hibernation in search for food and during this time, they also begin the search for a new roost. By building and placing bat boxes you are helping restore this species currently on decline and you are reducing your need for bug spray this summer – one bat can catch 12,000 mosquito-sized insects a night! This project is appropriate year round. This is another activity that can be done during any time of the year, but one that is probably most satisfying in the summer months. Pulling out pesky non-natives during the prime of their growing season feels good and helps encourage native species to grow in the newly opened habitat. Although placed in the summer projects, this activity can be done year-round. Adopting storm drains is a good activity for the summer because it doesn’t require too much physical exertion during the hot months. Additionally, this is a good time to identify these storm drains because stream flows are down due to the dry weather making it safer to visit these sites. Although learning about storm drains can be done at this time, adopting a storm drain is a long-term commitment and needs to be monitored year round. Creating a river sojourn event is really a year-round planning process, but the event generally takes place in the summer so we placed the sojourn in the summer projects. The summer is a great time for a river trip – it’s too hot to work and what a great way to plan a summer vacation for yourself and a bunch of your closest friends! 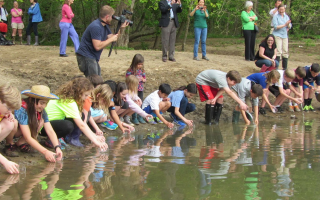 Writing a community environmental story is a year-round process and can be started at anytime. We placed it in the summer months because in writing these stories you often call upon teachers and professors to provide input or to help in writing. These professionals are very busy throughout the year, but generally have more time to help in the summer.